Questo rinnovato di recente, cottage sull'oceano ha tramonti spettacolari e una splendida vista di Stockton Harbor. Il ponte fronte acqua offre ampie opportunità per grigliare, rilassarsi e guardare barche, gabbiani, falchi pescatori e aquile. È un posto tranquillo e pacifico sulla bellissima costa del Maine. Tutte le camere sono state recentemente rinnovate, confortevole e attraente. La zona pranzo con vista sul mare è perfetta per il caffè del mattino e i tramonti serali. Ha una cucina completa. Siamo entusiasti di offrire questo noleggio per il primo anno! Provate a immaginare: Stockton Harbor con vela e barche aragosta, Sandy Point con i suoi sentieri spiaggia ed escursioni, e Fort Point State Park con il faro, area pic-nic e percorsi - tutti a cinque minuti di macchina! Ci sono un sacco di opportunità per gite di un giorno: Parco Nazionale di Acadia Bella è solo un'ora di distanza. Si può godere una splendida vista da Cadillac Mountain, negozi e ristoranti a Bar Harbor, un sacco di sentieri escursionistici, unico Sand Beach composta da conchiglie frantumate, e un orologio balena. Belfast, Camden e Rockport sono tutti facilmente raggiungibili in auto. La nostra casa ha tutti i comfort di casa, tra cui lenzuola, asciugamani, TV, internet, grill, e lavatrice / asciugatrice. Questo cottage può anche essere affittato in inverno ovunque da una settimana a tre mesi. Qualsiasi noleggio più lungo di 29 giorni non è soggetto alla tassa di alloggio del 9%. Fran è un cuoco gourmet disponibile a preparare alcuni pasti speciali per te se programmato in anticipo. 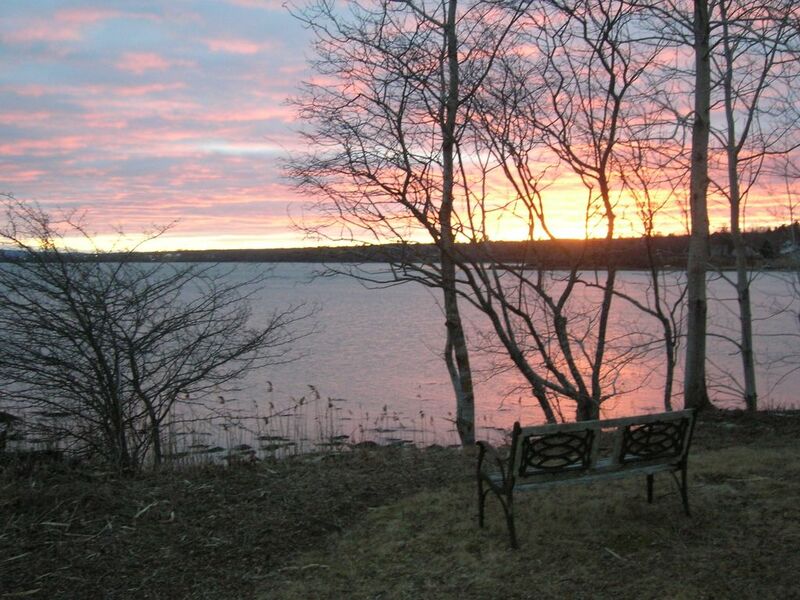 This cottage and its large yard with the beautiful view of the bay is simply a gem! When we arrived, our hosts Frannie and Dave had left for us a nice bottle of red wine on the dining table along with a basket of fresh organic veggies, which were absolutely delicious. Not only that, they left a half carton of organic eggs from their farm in the refrigerator, again a touch we appreciated very much! The cottage has all the comforts of a home, and it is ideal for couples or small families with just the right amount of space that a cottage should have. We loved the nicely done flooring throughout the whole house, not a creak or squeak could be heard anywhere! The deck and the back yard were a delight to watch the brilliant Maine sunsets from. We also loved the new patio furniture on the deck! The back yard itself is very serene, with apple trees, weeping willows and wild flowers along the edges of a large well-maintained lawn. It is a much more beautiful place than you could see from the photos! Adding to the convenience of this cottage were the washer and dryer in the basement, which allowed us to pack less clothing for the trip than otherwise. The washer had a lot of options for setting up just the right amount of water and temperature for any size wash load, along with various options for the wash cycle, which is nice to have in a vacation rental so you do not need to look for a laundromat. It really is like a little home away from home, right at the water front on Maine's famed coast! We definitely recommend this cottage, and are already telling about it to our family and friends, and we are hoping to be able to come back again soon!! Frannie and Dave were great hosts to have, and they responded quickly whenever we reached out to them. This cottage is a perfect ten for a relaxing getaway from everyday stress!!! Great guests! Would welcome them back anytime! Lovely view; nice deck and grill. Very attentive hosts with extensive organic farm near-by. The home needs some maintenance. Convenient location. We were happy with these guests, and surprised to read that they thought the house needs “some maintenance “. Any minor issues that arose during their visit (loose towel rod, putting screens in front door) were promptly fixed on the spot. A post review phone call to them revealed that the only maintenance issue they saw was that some windows needed new caulking. Had they addressed this with us directly, we would have assured them that custom replacement windows were already on order and scheduled for installation in September. We pride ourselves on the excellent condition of our rental cottage, and promptly take care of maintenance issues. Great location and super friendly hosts. This friendly couple made great guests and left the cottage immaculate . Experience was great. Stockton Springs is a charming little town and centrally located to Acadia, Belfast and Bangor. We would stay here again and highly recommend. Wonderful guests. Left the cottage in great shape. We hope they return again to Saltwind cottage. We were very pleased that they came to our concert. Coastal Maine stay was all we could have wanted ! Peace, water, , all the charm of downeast Maine! We picked a winner! Adorable cottage with all we neeeded, amazing yard, beautiful ocean bayfront, quiet seclusion, close to all the wonder of these beautiful coastal towns. Superb hosts who gifted us breakfast items and a treasure trove of the goodness of Maine! We can't wait to go back! Mid coast Maine / Penobscot Bay. La nostra casa si trova sulla bella Cape Jellison. Si ha la sensazione remota di un'isola con nessuno dei problemi traghetto. Fort Point State Park dispone di un faro storico, bei sentieri, viste grandi d'acqua e aree pic-nic, così come le rovine del forte. Il porto di Stockton, a 1,6 km di distanza, offre il nuoto, la barca a vela e la pesca delle aragoste. strada del Capo Jellison è un loop 5 miglia che è grande per andare in bicicletta. Nelle vicinanze si trova Spiaggia Point che ha sentieri belle e una vasta distesa di spiaggia per il nuoto e la spiaggia di pettinatura. La vicina città di Belfast ha negozi e boutique, ottimi ristoranti, un alimento naturale co-op, e un sacco di feste e musica. Belfast ha un cinema vecchio stile del centro. Il lungomare ha un sacco di attività in barca. Il parco nazionale di Acadia è a meno di 50 miglia di distanza e rappresenta un'ottima gita di un giorno. Bar Harbor, montagna Cadillac, Spiaggia di sabbia e ocean drive hanno così tanto da offrire. Panorami mozzafiato ovunque, grande trekking, nuoto, ed equitazione. Whale watching, negozi e ristoranti sono disponibili a Bar Harbor. Searsport, a 7 miglia di distanza, offre uno sguardo sul ricco patrimonio marittimo di questa zona presso il Museo Marittimo di Penobscot. Anche in Searsport è Sears Isola con miglia di sentieri escursionistici e litorale ottimo per birdwatching, pic-nic e motore ricreazione gratuito. Inoltre è vicino alla scenografica Penobscot Narrows Bridge, con un osservatorio che offre una vista mozzafiato sul fiume Penobscot e sulla baia. Accanto al ponte è Fort Knox State Park, un esempio di fortificazione costiera di granito del XIX secolo. Camden, con le sue famose boutique, crociere golette e pittoreschi lungomare, è a meno di 30 miglia di distanza.